Nitrile Vs Latex Gloves – What Are The Main Differences? Home>uncategorised>Nitrile vs Latex Gloves – A Clear Comparison! When it comes to choose between powder free Nitrile vs Latex gloves, it could be a little confusing to decide which one would be best suited, as it’s a common misconception to think that all gloves are the same. But it’s not true. Multi Range is here to help you decipher the difference and a clear comparison between nitrile vs latex gloves! What Makes Nitrile Glove Different? Latex gloves are sometimes referred to as rubber gloves due to the material they are made of. Latex is a natural product and collected from trees and plants much like rubber. Natural latex is stretchy, milky fluid which is used in materials which need to be waterproof, stretchy and resilient. Being a natural product means that latex gloves have many advantages. Firstly, due to its composition, latex gloves are extremely touch sensitive, it may make you blush, but that’s why condoms are made of latex! Which makes this an excellent choice for anyone who needs to work in engineering, or pharmaceutical industries where careful and fiddly work needs to take place. Due to the stretchy compounds, latex gloves are a superb fit and being a natural product they are more biodegradable and environmentally friendly. They also tend to be slightly cheaper than its nitrile counterparts. The only downside is that some people can have an allergic reaction to wearing rubber or latex and this can cause discomfort and contamination in others if wearers come in contact with someone who has an allergy to latex. 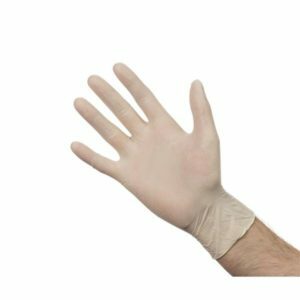 Latex vs Nitrile gloves may seem like a close race, and when it comes to durability and comfort, they are very similar and hard to pick a winner. However, the industry chosen and the type of work needed will instantly determine whether nitrile gloves or latex gloves are the best choices.